"This hearty casserole has bacon, eggs, hash browns, and three different cheeses all baked into a comforting breakfast dish, perfect for feeding a crowd." Heat a large skillet over medium-high heat; cook and stir bacon and onion until bacon is evenly browned, about 10 minutes. Drain. Transfer bacon and onion to a large bowl. Stir in potatoes, eggs, Cheddar cheese, cottage cheese, and Swiss cheese. Pour mixture into prepared baking dish. Bake in preheated oven until eggs are set and cheese is melted, 45 to 50 minutes. Let stand 10 minutes before cutting and serving. 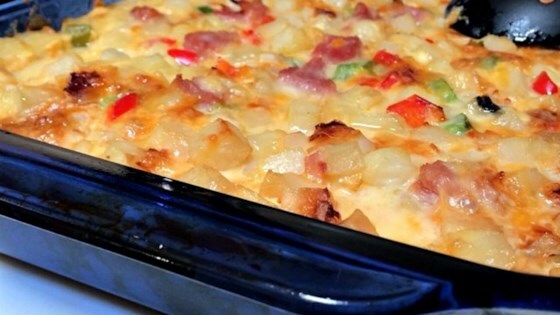 See how to make a cheesy breakfast casserole with bacon and hash browns. This is a sure fire winner! My family LOVES it! When I need to feed a crowd this is the recipe I use. It is delicious. There are never any leftovers - even if I make two pans. The guys in my office request it often. YUM! My favorite. So delicious and easy! I love that there's no bread in it. Not a swiss cheese fan, but it's delicious in this! YUMMY!